Atheneum Books for Young Readers, 9781442417045, 272pp. May 2011. 272 p. Atheneum, hardcover, $15.99. (9781442417038). lice infestation, and it’s only logical that Gabe also gains confidence in his own opinions and individuality. Gabe’s father is remarrying and giving him the (step-) brother he’s always hoped for, but ten-year-old Gabe realizes almost immediately that cool Zack, also ten, will not be impressed that his new brother is heading off to the Summer Center for Gifted Enrichment, a.k.a. 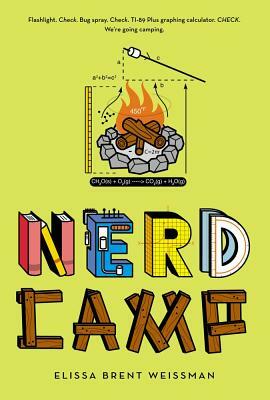 “Nerd Camp.” Once there, Gabe loves camp with its interesting classes (e.g., Logical Reasoning and Poetry Writing), its traditions like Color Wars, and his new friends, but he continues to worry about Zack’s reaction. As the six weeks go along, Gabe creates a chart of “Things I Can Tell Zack” (“We put music and sports pictures on our walls”) and “Things I Can’t Tell Zack” (“They are of Beethoven and the rules of badminton”). The title may limit the book’s appeal, but kids who are even a little bit nerdy themselves will enjoy the humor and will relate to Gabe’s concerns about appearing geeky. Weissman (The Trouble with Mark Hopper, rev. 11/09) gets the small details just right (like the way Gabe and his roommates keep track of how many seconds it takes their bunkmate to get out of his twisted-up sleeping bag each morning), and the relationships and the stories come to a satisfying and reasonably realistic conclusion. Gabe, 10, can hardly wait to dive into the sonnets, syllogisms and scavenger hunts at the Summer Center for Gifted Enrichment, a sleepaway camp for bright kids. That is, until he discovers that his soon-to-be stepbrother, Zack, scorns such things as nerdy. With his cellphone, surfboard and poor spelling, Zack seems the epitome of cool, and bespectacled Gabe yearns for a similar sangfroid. Gabe’s path to geeky self-acceptance is filled with quirky adventure. There’s a UFO sighting, a stealth kayak mission and a clandestine lice-breeding lab, along with bunkmates who recite the digits of pi (for fun!) and tape pictures of Beethoven to their cabin walls. Fans of “The Big Bang Theory” may recognize in Gabe and his smart, funny friends the youthful counterparts of the zany brainiacs on that popular TV show.